Successful international expansion requires entering the best markets: New York, Paris, and Peckham London. Bringing their bags to London because they're no Fools, Mission Warehouse. 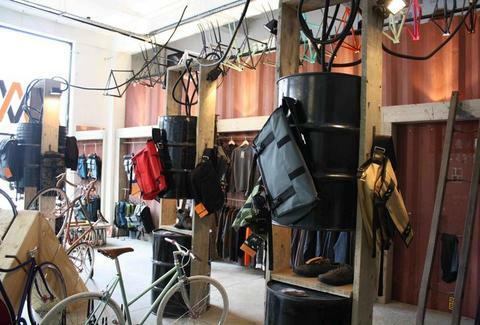 Marking their first int'l venture, San Francisco's Mission is targeting our burgeoning bike scene with their entire range of backpacks and messengers, setting up shop in a roomy Old Truman Warehouse space; industrially decked with corrugated iron & oil drums, it's shared with frame builders 14bikeco., even though at 14 you hate sharing. Coming in five colours, rugged backpacks are all weather-proofed, and incorporate a frame sheet with fibreglass rods for stability/comfort, plus an expandable cargo compartment: the smaller Rambler doubles in size from 22-44L, the larger Vandal from 30-65L -- so now instead of sacking Rome, they can store it in a handsome accessory. Three differently sized messenger bags (dubbed Shed, Rummy & Monty) are also element-defying, with five internal zippered pockets, a laptop-ready external compartment whose fabric cover can either go "roll top" or "flap down", and a reversible padded shoulder strap w/ custom hardware for one-handed adjustment -- though if you've already got one hand in your pocket, the other will no longer be able to give a peace sign. Pity. Mission will also be slinging their new "Rondel" skate-trainer-style bike shoe, made fully SPD compatible via a recessed cleat that neatly clips to the pedal, making for a controlled ride, so you won't fall off your Boycie-cle into The Green Green Grass.